Altech’s Eurostrips are safe, economical and meet worldwide standards. They are a cost-effective alternative to barrier strips that require labor-intensive wire lugs and they reduce the number of electrical connections in circuits. Eurostrips feature tubular screw clamps, wire protectors, and are ready for immediate wire hookup. Eurostrips are ideal in small spaces, which means more room for other components or reduced enclosure size. Free float or mount them onto any panel. They are available in easy-to-cut 12-pole strips or pre-cut. Feed-Through Eurostrips are supplied with wire protectors. Offered with flat bases or standoff feet, they are molded of self-extinguishing polyamide. Custom imprinting and marking plates are available. Eurostrips are mounted quickly in panels. Use standard screws or mounting pins, offered as accessories in this section, or leave them free floating to completely eliminate mounting. What could be easier? Simply strip the wire insulation, insert the wire and tighten the screw to achieve a gas-tight, electrically efficient connection—every time. Wire lugs are eliminated, saving material cost and installation time. Offered in easy to cut 12 pole strips, they can also be ordered precut with the required number of poles. Polyamide housing can be cut with a utility knife or hacksaw, providing flexibility to meet changing needs. Because standard 12 pole strips can be so easily cut to the required number of poles, stocking is simplified and inventory is minimized. The basis for the Eurostrip’s reliable connection is a precision machined tubular screw clamp insert made from highly conductive copper alloy which is nickel plated for maximum corrosion resistance. The clamping screw material is high strength steel to prevent screw head breakage or thread damage. This provides trouble free operation. Screws are electrogalvanized and bluechromated to provide corrosion resistance. Optional nickel plated brass screws may be ordered for highly corrosive environments or marine applications. Standard Eurostrips feature stainless steel wire protectors. Unlike wire protectors found in many competitive products which use copper alloy materials, stainless steel has superior memory characteristics. Accordingly, the wire protector will return to its original position even after repeated use. This means trouble-free wire insertion and quicker reconnections. Eurostrip housings are injection molded from self-extinguishing polyamide 6.6 molding material, possessing high dielectric strength and excellent electrical insulation and temperature resistance. Each housing has been specially designed to provide creepage and clearance distances to achieve ratings up to 600V. Choose low profile, flat base housings for minimum clearance applications (300V) or housings with mounting feet for maximum voltage isolation (600V). External jumpers bus potentials between poles on Eurostrips, eliminating wire jumpers and reducing wiring time. Isolation partition increases clearance between adjacent poles and provides visual separation for more efficient wiring. Mounting pins simplify installation and mounting of Eurostrips. Simply drill the mounting hole, position and install the pin from underneath the panel. When correct position is reached, pin will retain terminal to panel. Identify circuits and reduce wiring mistakes with marking plates. Order plates imprinted or blank. Position under or on top of a Eurostrip housing. Imprinting Eurostrips reduces wiring errors and helps to identify circuits. Use Imprinting to mark individual poles when high quantities are involved or custom imprints are required. For wire-to-wire connections in HVAC, appliance, equipment, power distribution and other industrial applications with strict budget and space requirements. Easy to use double row terminal strips are a cost-effective alternative to barrier strips or other types of terminal blocks. Simply strip the wire, insert and tighten the screw. Eurostrips feature tubular screw clamps, with wire protectors, and recessed metal parts for finger protection. The stainless steel wire protectors exhibit excellent memory and the most effective connection. Eurostrips described on this and the following page are available with a flat base for minimum clearance applications. They can be panel mounted or left to free float. Offered in easy to cut standard 12 pole strips, they can also be ordered precut with the required number of poles. For wire-to-wire connections in HVAC, appliance, equipment, power distribution and other industrial applications with restricted budget and space requirements. Easy to use feed through terminal strips are a cost-effective alternative to barrier strips or other types of terminal blocks. Simply strip the wire, insert, and tighten the screw. Eurostrips feature tubular screw clamps, with wire protectors, and recessed metal parts for finger protection. The stainless steel wire protectors exhibit excellent memory and the most effective connection. Eurostrips described on this and the preceeding page are available with standoff feet for increased wiring efficiency. They can be panel mounted or left to free float. Offered in easy to cut 12 pole strips, they can also be ordered precut with the required number of poles. For wire-to-wire connections in HVAC, appliance, equipment, power and other distribution applications. 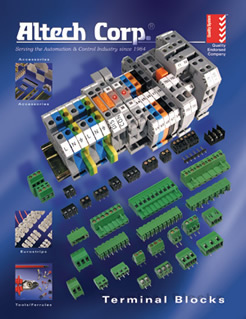 Pluggable Eurostrips® speed and simplify replacement of subassemblies, etc. They reduce downtime and misconnections. Two-piece pluggable terminal strips feature tubular screw clamps, with recessed metal parts for finger protection. A spring loaded contact prevents inadvertant unplugging. The headers and plugs are available with flat base or standoff feet and can be panel mounted or free float. Offered in easy to cut 12 pole strips, they can also be orderd precut with the required number of poles. Convenient options that facilitate installation and wire termination. Bus potentials between poles on Eurostrip Terminal Strips reducing wiring time and eliminating wire jumpers. Jumper Pole positions may be removed to provide selective jumpering. When using external jumpers, the terminal's rated cross section is usually reduced one wire size. For jumper maximum current ratings, refer to the corresponding Eurostrip IEC/VDE current rating. Speed panel mounting of Eurostrips with Mounting Pins. Simply match drill clearance hole in panel, position Eurostrip and install Mounting Pin through hole and into mounting hole in Eurostrip housing. Once pin passes beyond Eurostrip housing, it automatically expands, securing housing to panel. Use two or more mounting pins per Eurostrip. Install Marking Plate MP under or on top of Eurostrip housing to identify individual pole positions to increase wiring efficiency, save installation time and facilitate wire hook-up, system modification and trouble shooting. Select blank marking plate for hand marking or imprinted. Mark individual pole positions to save installation time and facilitate wire hook-up, system modification and trouble shooting. Choose turret marking for optimum identification. To order imprinting specify consecutive, identical or custom character imprints.